Dodgers president Branch Rickey was preaching caution,9 but conceded on the night before Opening Day, “This is the best team coming back from spring training I have ever been associated with.”10 Rickey’s bold social experiment of desegregation was set to pay its biggest on-field dividend yet. 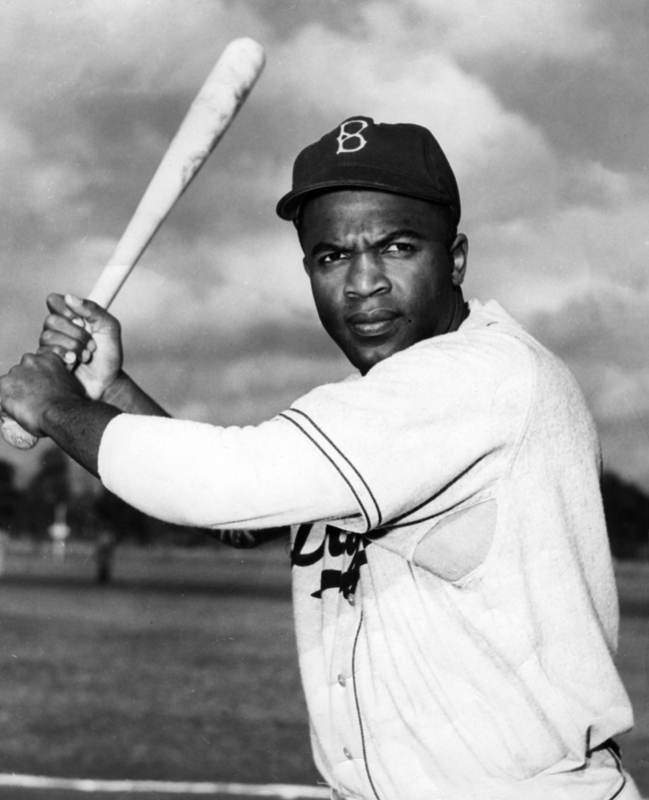 Jackie Robinson was established as the starting second baseman and cleanup hitter, Roy Campanella was starting his second season behind the plate, and pitcher Don Newcombe would soon be called up from Montreal.11 The first three African Americans in the National League would all play for the Dodgers,12 and they would all help make the team a contender. Jackie Robinson led off the bottom of the fourth with the Dodgers down 3-1, still looking for his first hit of the season after grounding out in the first. Robinson swung at the 2-and-2 pitch and lifted it into the left-field seats to bring the home crowd to its feet. Four batters later, Campanella came to the plate with runners at the corners and the Dodgers still down by one. He swung at the first pitch and hit a deep line drive that cleared the wall before curling around the foul pole.19 The Dodgers took the lead, 5-3. The Dodgers would pour it on with another four-run rally in the seventh. They were facing reliever Hank Behrman, whom the Dodgers sold to the Giants in the offseason. Pee Wee Reese led off with a single and Robinson added a single to center. Robinson reached third on a Cox single that scored Reese, and came home on a wild pitch to Hodges to make it 8-3. After Hodges singled to put runners at the corners, Campanella hit his loudest blast of the day, a fly ball to deep center field. It looked like his second round trip of the day, but the wind suddenly held it up. Bobby Thomson slipped and fell making the adjustment, and the ball hit the ground.21 Two runners scored and Campanella made it to third on the error. Hatten, for whom Dodgers manager Burt Shotton was about to pinch-hit in the fifth before Campanella homered,22 held the Giants hitless the rest of the way and the Dodgers won 10-3. 1 “Ebbets Field Jammed in Real Holiday Style,” Brooklyn Daily Eagle, April 19, 1949: 3. 4 John Drebinger, “Dodgers Rout Giants With Pair of Four Run Innings Before 34,530,” New York Times, April 20, 1949: 34. 5 Arthur Daley, “Battle of the Boroughs,” New York Times, April 20, 1949: 34. 6 Harold Burr, “Dodgers Call on Hatten to Oppose Giants,” Brooklyn Daily Eagle, April 19, 1949: 1. 7 Lyle Spatz, “Jackie Robinson on Opening Day, 1947-1956,” in Joseph Dorinson and Joram Warmund, eds., Jackie Robinson: Race, Sports, and the American Dream (London: Routledge, 1998), 136. 8 Carl T. Felker, “Experts Vote for Red Sox, Dodgers,” The Sporting News, April 20, 1949: 1. 9 “So many prognosticators are throwing their opinions around that the Dodgers are going to win the National League pennant that President Branch Rickey is frightened lest this ball club gets a big head and blows the works,” wrote Harold Burr. “Burr Sees Dodgers Copping N.L. Duke,” Brooklyn Daily Eagle, April 17, 1949: 23. 10 “Knot-Holers Hail ’49 Dodgers as ‘Champs,’,” Brooklyn Daily Eagle, April 19, 1949: 3. 11 Tommy Holmes, “Red Barber’s Pet and Other Rookies,” Brooklyn Daily Eagle, March 10, 1949: 27. 12 Larry Doby broke the American League color line with the Indians in July of 1947, followed by Hank Thompson with the St. Louis Browns later that month. Monte Irvin and Hank Thompson would debut together for the Giants in July of 1949. No other major league team would integrate before the decade was out. 13 Jackie Robinson and Alfred Duckett, I Never Had It Made: An Autobiography of Jackie Robinson (As Told to Alfred Duckett) (New York: HarperCollins, 1995), 79. 14 Arnold Rampersad, Jackie Robinson: A Biography (New York: Alfred A. Knopf, 1997), 208. 17 Herman O. Krabbenhoft, Leadoff Batters of Major League Baseball: Complete Statistics, 1900-2005 (Jefferson, North Carolina: McFarland, 2006), 343. Rigney was the second visiting leadoff batter to hit a home run on the second pitch of the season, joining Charlie Jamieson of Cleveland, who homered on Opening Day in St. Louis in 1925. A first-pitch Opening Day home run by a visiting batter would not occur until Gary Thomasson of the Giants achieved the feat against Don Sutton in Los Angeles in 1977: at least five more players have done it since then. Krabbenhoft, 343. 22 Harold Burr, “Dodgers Swipe Giants’ Thunder,” Brooklyn Daily Eagle, April 20, 1949: 27. 25 This nickname referred to the Dodgers’ previous name, the Robins. 27 Spatz, “Jackie Robinson on Opening Day,” 137.